The bathroom is usually the smallest room in the house. Apart from expensive designer baths or crystal bowl wash basins, designs remain simple, basic and uninspiring. Colour - white is the best colour for a suite because it's timeless and matches everything. Consider changing your suite to white - replacement toilets and wash basins can be relatively inexpensive and bath re-enamelling is now more reliable. 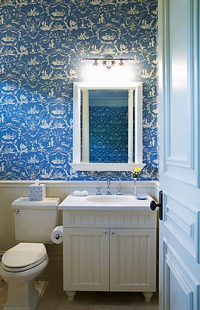 Decorating - tile paints and transfers can update and open a small space. Storage - de-clutter your bathroom. All toiletries and towels don't need to be stored in the bathroom. Flooring - hygiene and safety are paramount. A wood or vinyl flooring is currently the most fashionable and they help to make a floor space appear larger. Lighting - building regulations dictate the positioning of sealed units within bathrooms.